← Are You Suffering from an Overweight Mattress? 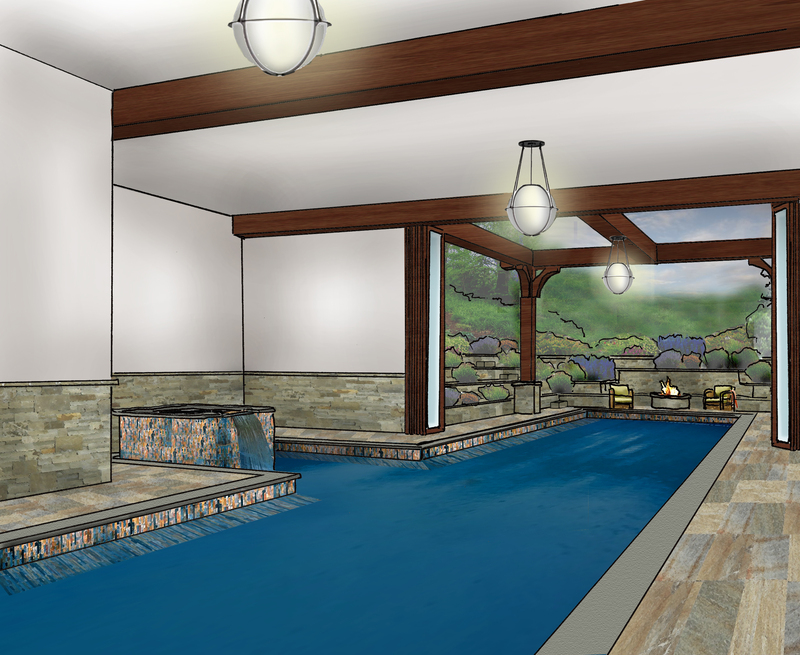 About a year ago a client approached us about a vacation home he was planning in Deer Valley, UT. He was planning to use the home like a time share with several families owning a share. Before he could move forward with construction, he needed to sell the shares. As we all know, it’s difficult to sell anything in the current real estate market. Selling a set of plans is even more difficult. 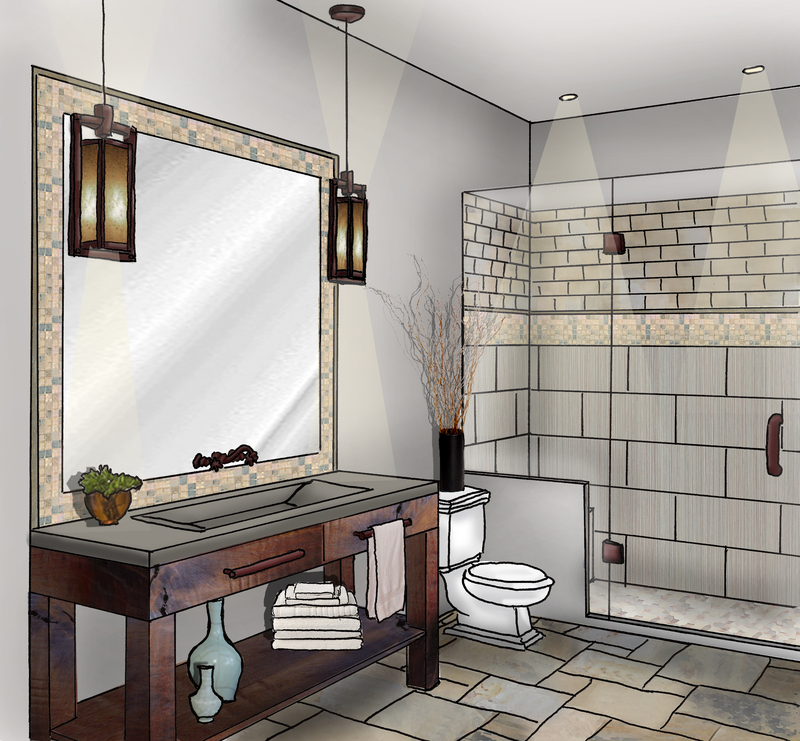 Our client asked us to help him give perspective buyers an idea of what the home would look like once it’s completed. Designing a home from start to finish is a colossal task that usually takes several months, but he wanted renderings depicting the design completed in a month. Here is what we came up with. Please note that these renderings are not meant to be photographs. We were trying to give a representation of how the home would feel when completed. Interior design and renderings are by Pamela Jensen of Atmosphere ID and the architecture is by Bill Van Sickle. The home will be nestled into the mountains above Jordanelle Reservoir with amazing water views. 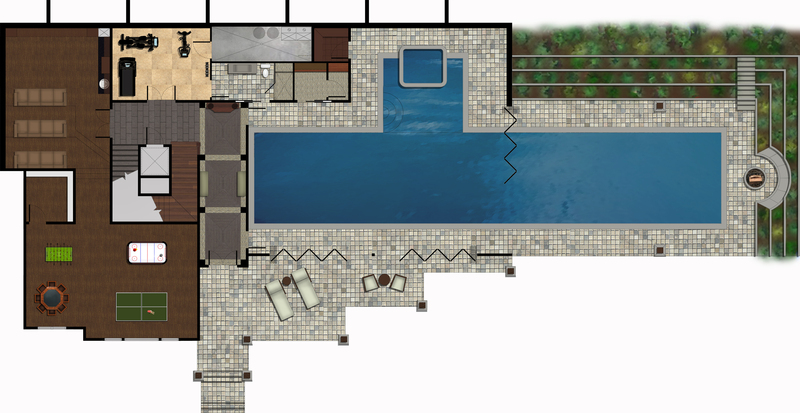 Here is the lower level floorplan. It includes an entry gallery, indoor/outdoor pool, locker room, gym, theater, and game room. Because you enter the home in what essentially is the basement, it was important to create a grand entry so visitors didn’t feel as though it was a basement. The goal here was to keep the pool from feeling like a rec. center pool. Beams (which continue outside to create a pergola) and light fixtures were added for a custom feel. The pool bath is a little on the contemporary side with a nod to the rustic setting with the rustic wood vanity and the iron pendants. 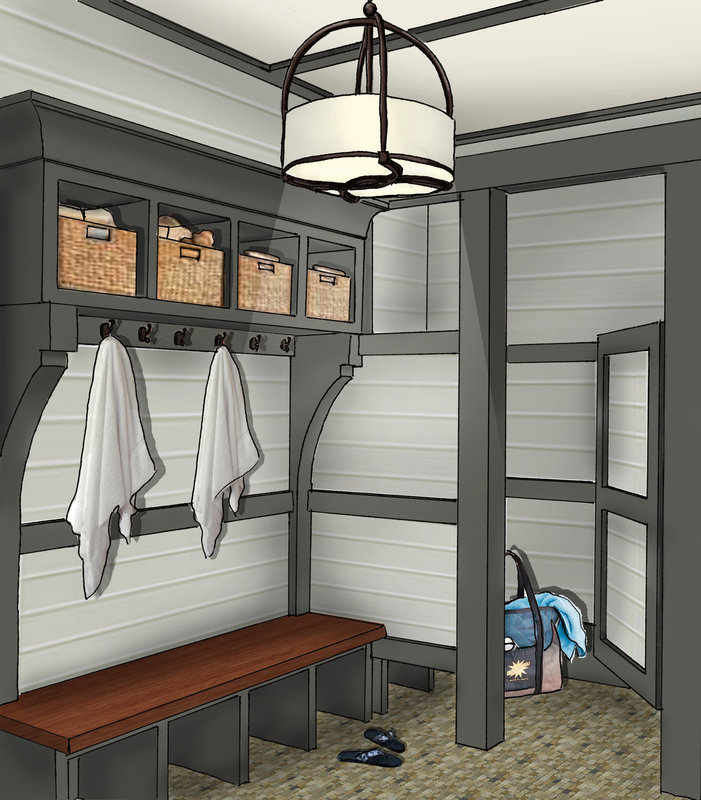 The architectural plans called for lockers wrapping around the locker room. The client requested a private dressing area so the room could be used by more than one person at a time. This is what Pam came up with. 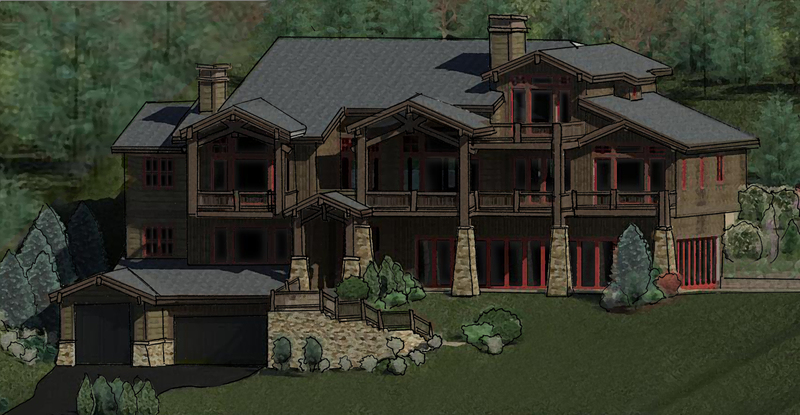 Our client wanted an elegant mountain home not a rustic cabin. 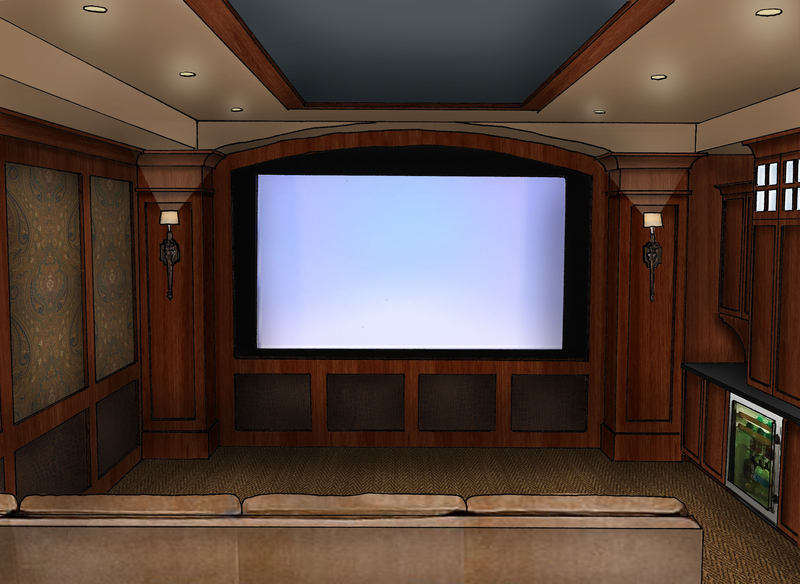 Paisley and leather panels in the theater and to the elegant feel of the home. 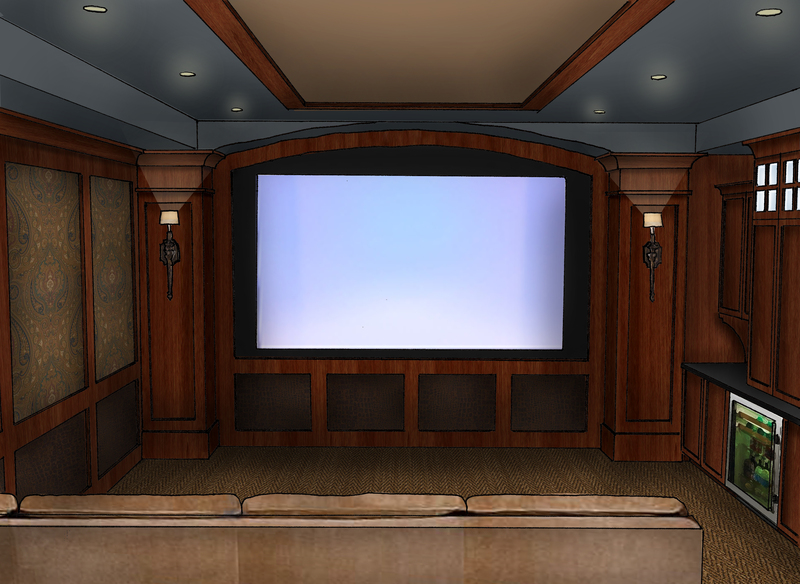 Two options were provided for the ceiling color in the theater. Which one is your favorite? We’ll be traveling to the next level soon. 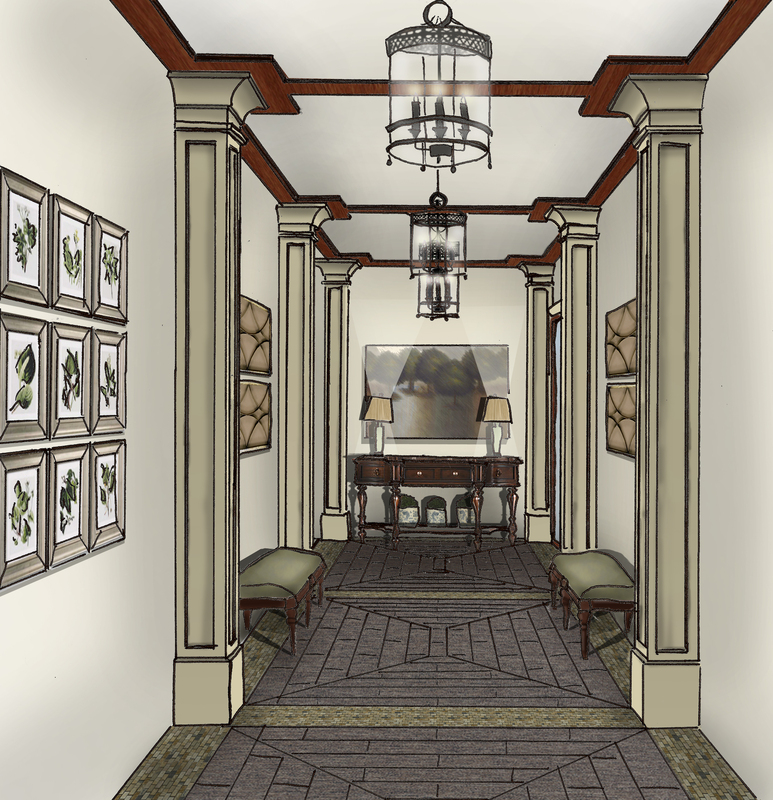 This entry was posted in Interior Design, Portfolio. Bookmark the permalink. I would go with the second colour option! Amazing home! Pam, these renderings are amazing! You are such an awesome designer. Amazing work – these are crazy !! I love that entry!